Home › Reviews › What Is THWGlobal? Before we get into What Is THWGlobal, I need to address an important update has happened for the THWGlobal also known as,”Ten Hours Weekly Global”. 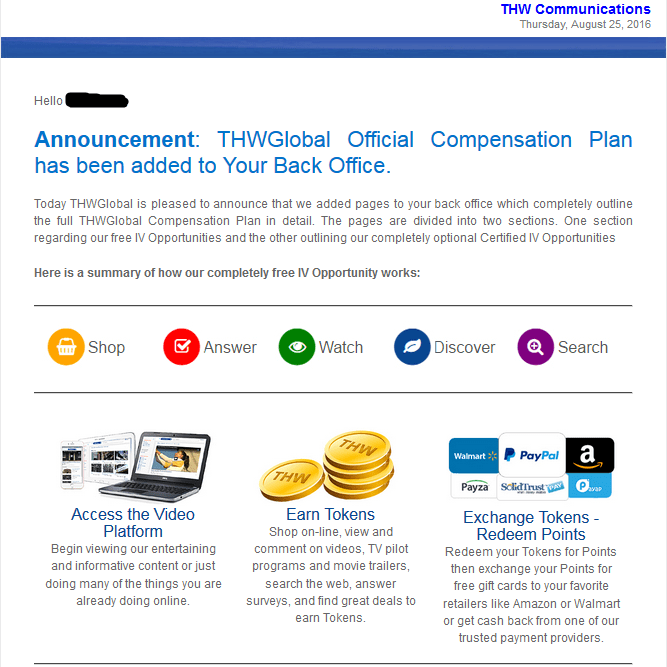 As promised in my first review of THWGlobal, Is THWGlobal A Scam?, I promised I would update if any new information was found out about the company and I would like to fulfill on that promise of keeping you update on the situation with THWGlobal. THWGlobal Officially has launched their Beta Testing and has officially started. This is definitely positive proof the company is moving in a good direction towards being legitimate. THW Global currently has a market potential of an estimated two billion people globally. Currently, Facebook has 1.71 billion users of which 500 million login every day. This means the current IVs of almost 1.4 million has a future IV to prospect ratio of 1400 prospects for every current IV. Now let’s fast forward one year and estimate that THW Global will have 15 million IVs. The prospect ratio would be reduced to 130 prospects per IV. Fast forward another year or two and estimate THW Global will have 50 million IVs. The prospect ratio would be reduced to 40 prospects per IV. Because of the serious Ten Level Team that my Team Leaders have currently built this will not be a concern of ours one, two or even three years from now. All because we took action now while the prospects are 1400 to 1 instead of 40 to 1. Great example especially here in the USA. Imagine if you were selling Facebook accounts. How many people would you have to approach to find one who does not have one? Within 3 years THW Global new IVs will have that same problem! Take Amway as an example. in the 60’s there were thousands of distributors and now there are millions! The prospects today are very very few compared to the 60’s and the same will happen with THW Global but it won’t take 50 years. More like 2 years! Right now building a Ten Level Team is 100 times easier than it will be 2 years from now or even a year from now most likely. WHY? Most of the people you know would have heard of it or already became an IV for THW Global! You see my current Ten Level Team above and that is in only 109 days – could you even imagine what it will be in one year or two? – most probably in the millions of IVs. If I just made 50 cents a month per IV only counting The Power Bonus, it would exceed every financial goal I have imagined in my 40 years not just for me but for many, many more people just like you. Again as an IV viewing is the foundation. Get your 5 hours weekly in but focus on building a TEN LEVEL TEAM. Viewing will always be available! FACT: Viewing Opportunity Will Always Be Here. We cannot say the same when it comes to building a Ten Level Team. That is where the REAL OPPORTUNITY is TODAY! Please very important continue reading very Important Advice Part II. I’m completely positive about this or I wouldn’t have spent a considerable amount of money building and maintaining our team website, social media pages, etc. so that I could help my team.. The advertising world is different than the MLM Division of THW Global …the profile of the company will soon appear by stage 4. This I’m sure… I have been involved in very chaotic situations that brought so many people to call or visit startup companies that it overwhelmed them because they weren’t ready to receive the visitors nor the calls. How can you or anyone doubt that this is a huge endeavor, company is having 10s of millions of page views and tens of thousands of people watching videos at the same time daily…do you have any idea what the bandwidth cost is? The day they had almost 12,000,000 page views it was over $24,000 alone, that is a daily expense! Opening up 9 to 10 satellite offices around the world…I don’t know where you live but I live in the USA and the company office is in Las Vegas…2300 West Sahara suite 800. THW Global has over 15 programmers working 24 hours a day in shifts, not to mention all other expenses related to starting something as big as this. They are looking to secure 10% of the Digital advertising market that is considered to be $674 Billion by 2020, they are looking for $67 BILLION portions. If you don’t have the confidence please don’t do this, come back 6 months from now and check it out again. To say this might be a scam is not even considered by me as possible… I wrote about this months ago. The naysayers will always be there but look at what has happened in only 100+ days, it is record-breaking and never seen before in the history of our industry. I do not convince anyone to do this, if it makes sense to you, do it; if it doesn’t make sense don’t do it… I seldom, if any, spend this amount of time answering a question of how this company is a scam because I wrote a blog about this already and I stay positively growing my business and working with my leaders. Leaders that are working, that are committed, that are IV Certified, that will be involved in $10 Power Bonus and that care about helping their teams. All of the above dates are in concrete since so many IVs want to wake up on 10/16 and 10/17 and see their 1st commission earnings posted in their back office. THW Global estimates thousands of IV commissions from $10 to $10,000 will be posted in many Active Power Bonus IVs and Active Certified IVs. After the above dates, all of these types of commissions are posted and pay commissions in real time. If a sale/order is posted at 3 pm on any day by 3:01 pm everyone qualified in the upline to receive a commission will see it in their back office! All of the information in this communication is not from THWGlobal Corporate but from THWGlobal Field Team Leadership who are IVs same as you. Except we are Certified IVs and each one of us has built a Ten Level Team in excess of 100,000 IVs and are fully Committed To Build Only THWGlobal. IV Complaint: watching advertising sometimes took up more time than watching the actual video. That this made it more difficult to do the initial 10 hours or the weekly 5 hours. In fact, it may have doubled the time needed to accomplish such. THW Global Solution: THW Global is having the programmers rewrite the tracking to INCLUDE all advertisements in the TIME COUNTER. Now, this may take a week or 10 days to do so be patient! Want more MORE GOOD NEWS! Read the next statement below! THW Global is also going to ask the programmers after they write the new programming to go back and track all the time invested from day one of watching and include any and all advertisements already watched! Want more MORE GOOD NEWS! Read the next statement below! THW Global is also going to increase tokens for every 34 seconds of n advertisement watched. 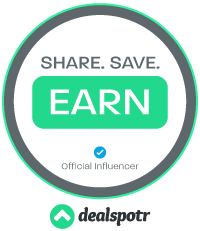 So if there is a 5 or 10 minute advertisement you will earn a token for every 34 seconds! So a 10-minute ad would give you 17 Tokens! So VIEW! VIEW! VIEW! and BUILD! BUILD! BUILD! PAY SYSTEMS SHOULD SHOW UP IN YOUR BACK OFFICE NEXT WEEK! Rich Devos Founder of Amway Corporation #29 America’s Largest Private Companies on Forbes List did 9.5 Billion USD in 2015. He preached and taught that there are four stages to every business, marriage, church, charity or whatever you are building. Building Stage: Everyone did whatever was needed to do to get the job done! Management Stage: Everyone started being in charge of different parts of getting the job done! Blaming Stage: Everyone started to blame each other for the job not getting done! Destruction Stage: The job never got done. Business shut down. Marriage end in divorce. Church split up. Rich Devos said the only way to stay away from the Destruction Stage is to never leave the Building Stage! At THWGlobal prior to even getting started the Founder’s Team vowed to always stay in the Building Stage. Below are Four Building Stages for which the THWGlobal Opportunity will be built on. Before we talk about the 4 Building Stages of THWGlobal let’s address the simplicity of THWGlobals success formula! If you said YES to both questions you have the building blocks to be successful in the THWGlobal Opportunity! Food for thought: Stage 1, 2 and 3 are the hardest stages to get involved in a program. However, these are the stages where the most benefits for future income are found. Example every IVs Power Leg and Dual Team Leg is already built and can end up paying you for years to come! This was planned to be a 30 day Pre-Launch utilizing a single page registration with partial back office. Tracking of Team building efforts were displayed in real time with an internal messaging system! Pre-Launch was considered a huge success! The goal was to attract possibly 50,000 IVs just in the USA. Instead THWGlobal ended the first 30 days registering over 600,000 IVs in over 200 countries who were averaging over 1 to 2 million page views daily. This was an additional 40 days planned as a Soft-Launch introducing the video viewing platform and developing a viewing and tracking system. Even though we planned OUTSIDE and third Party advertising to be in Stage 3, THWGlobal was able to procure outside advertising via third party Media Groups earlier than planned. Thus we were able to start to do some real tracking and accounting of viewing in Stage 2. THWGlobal with this advance success was also able to allow many IVs to get their 10 initiation hours in during this time. Many Back Office tools were also developed during this period. Including the building of many options mentioned in the next stage. Soft-Launch was considered another huge success with over 1.3 million register IVs viewing an average of 3 to 5 million page views daily. Stage 3 will be 90 days of post Soft-Launch which began on 9/21/2016. Outside advertising sales will continue during this stage. Outside advertising is estimated to be only 10% of the sales revenue expected from inside advertising sales which will begin in Stage 4. This stage will also introduce the exciting THWGlobal eLearning Package along with our POWER BONUS. Sales of the eLearning Package will also enhance the global viewing and team buildings pools by generating higher Token values as a large portion of the sales price will be contributed to the global viewing pools. During this stage we will be offering online IV Certification for ad sales. Once Certified we also plan to allow our Certified IVs to begin selling inside advertising. It is fully anticipated that inside ad sales will substantially increase the value of viewing Tokens as these ad sales should generate much higher ad revenues than those associated with our third party vendors. All Viewing Tokens will initially be converted to Points on Nov 24; for all Viewing done through 10/31/2016, thereafter Viewing Tokens will be redeemed for Points on the 24th of each month. Once redeem for Points your Points can be immediately converted to cash and withdrawn. Management Bonuses, Coded Bonus and Power Bonuses will all begin paying during this Stage as well. Once the initial payment of the various bonuses has been made, all future earnings will calculate in real-time, 24/7/365 and will release for payment 10 days later. This Stage is also looking like a huge success for THWGlobal as on day one we saw almost 12 million page views. The goal is to finish this Stage 3 with exceeding 3 million IVs viewing over 25 million pages daily. Fully operational systems with all cylinders firing! With Inside and Outside Advertising sales generating the maximum CPM values for the company with major long term increases in value of viewing Tokens! Stage 4 “building” is expected to last for generations to come; building to 100’s of millions of IVs. 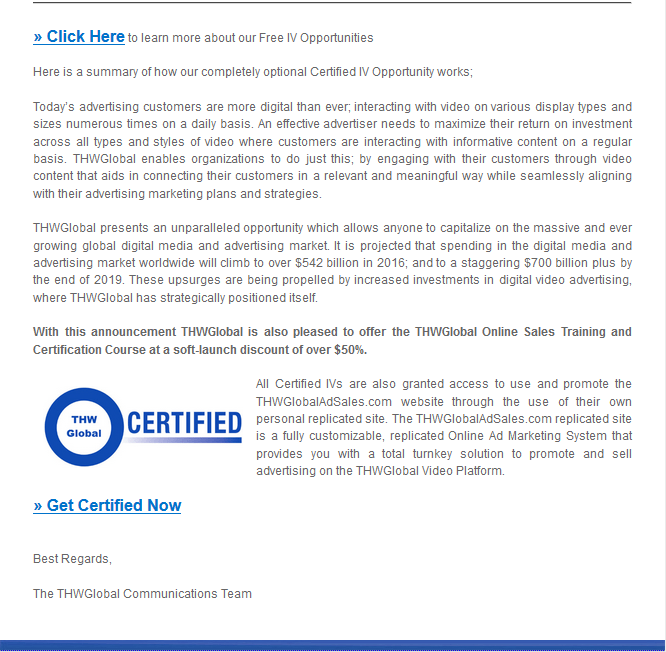 THWGlobal has a five year goal to own just a few percent of the global online internet advertising space which is estimated to be over $7,000,000,000 ($7B) dollars by 2021. STAGE 1 to STAGE 4 are all building and growing stages. THWGlobal promises it’s IVs that they will always stay in the BUILDING STAGE of helping and sharing their revenue with our global base of IVs! We believe that THWGlobal is creating something that will last more than a lifetime were IVs will be passing their business on to their children. Via our global viewing and Token System the richer countries are helping the poor countries! Viewing and Team Building is like Socialism where everyone shares equally and getting Certified and Team Building is like Capitalism where one can make as much as one can dream! Everyone will end up making a lot more than they expected! Just keep on Viewing and Building your Ten Level Team! FOR AN ESTIMATED 5 Or More DAYS AFTER PAYMENT SYSTEMS ARE INSTALLED! DID YOU KNOW? It’s currently costing THW Global in excess of $15,000 daily to maintain the THW Global website which includes video bandwidth. It is getting so much traffic that a 3rd party website after only 90 days gives the website a 77 Million Dollar Value. THW Global will soon have their Certified IVs and their in-house corporate sales team selling in-house ads.This has the potential of multiplying IV INCOME ten fold. 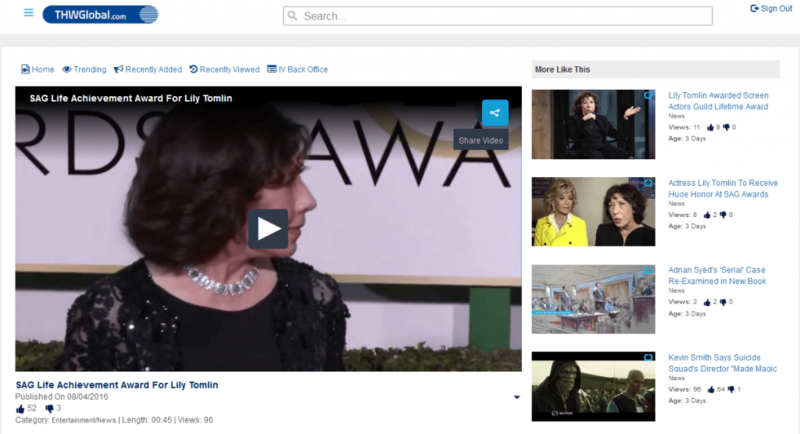 This will also help our IVs to earn their up to $1,000 monthly from viewing and supporting all the advertisers. All we have done to date is view and support outside advertising sales whereas other companies who sell such ads make the bulk of the money and THW Global gets a small fraction to share with it’s IVs. This is why every IV should not only do their minimum 5 hours of viewing, supporting and buying whatever they need from current advertisers: but MORE IMPORTANTLY build a ten level team. Building a ten level team during the next six months will help every FREE IV earn their $1,000 a month just with the simple very inexpensive $10 POWER BONUS. THW Global has already proven that we are the easiest and fastest system to build thousands if not tens of thousands and some hundreds of thousands of IV Ten Level Teams. What’s easier than getting someone to sign up for 100% FREE then have them check their account within 24 hours and seeing that they already have thousands of IVs in their POWER LEG that could make them money if they too are building a ten level team. Any one who is not building a TEN LEVEL TEAM just does not understand the power of DUPLICATION. What is more valuable to our FUTURE IN HOUSE ADVERTISERS? YOU viewing and supporting them 5 to 10 hours weekly “OR” your ten level team of 100s or 1000s (thousands) viewing and supporting them a few hours weekly! HOW DO YOU GET A TEAM OF THOUSANDS? You just tell two who tell two and in 10 levels you have over 2000 IVs! Never mind the fact that the POWER BONUS will get you to $1,000 a month faster than any other BONUS that THW Global offers at this time. An HOUR ago, you would have HUNDREDS of IVs in your POWER LEG. A DAY ago, you would have THOUSANDS of IVs in your POWER LEG. A WEEK ago, you would have OVER 10 THOUSAND IVs in your POWER LEG. A MONTH ago, you would have OVER 50 to 100 THOUSAND IVs in your POWER LEG. TWO MONTHS ago, you would have OVER 500 THOUSAND IVs in your POWER LEG. THREE MONTHS ago you would have OVER A MILLION IVs in your POWER LEG. In order for an IV to maintain their POWER LEG Position they will need to activate it. Please check your back office for the details. 9/21/2016 is only hours away. THW Global has done what most people would say was impossible. In just 90 days we have attracted over 1,250,000 IV Customers/Affiliates along with over 1000 leaders globally. We the leadership were told from day one that it could take at least 6 months to build up the inside advertising clients to begin paying people what they need to be paid to be and stay excited. We are waiting for our Pay Systems to be integrated with PayAp, Payza, Solid Trust Pay, Bit Coin and many others to work with IVs especially with International Transactions and IV Certification courses. IV CERTIFICATION: As long as you register in the back office to purchase the IV Certification course it will freeze the 50% discount price for your Certification. Then once the payment systems are set up you will have several days to make such payment and THW Global will honor such discount. The current discount will no longer be available to hold or for the people who register after 9/20/2016 at MIDNIGHT EST. At which time the price will change. So be sure to do it ASAP at least order it so if you do choose to become a Certified IV you will SAVE 50%. The THW Global $10 Power Bonus Creates More $1,000 Earners! Than Any Other Program In 70 Year Industry History!!! When you say my counter is not working correctly! #1 MAKE SURE YOU ARE NOT JUST LOOKING AT YOUR DAILY TOTAL! #3 TOTAL HOURS WILL BE AT BOTTOM OF EACH PAGE! #4 THEY ARE WORKING ON IT TO SHOW TOTAL TIME! Programmers are constantly working on the Viewing Stats Counter. When you look at the bottom viewing time registered stat shows the total for just that page! You will notice if you click on “This Week” you may have multiple pages. It will show you YOUR STATS PER PAGE so you may have multiple pages. The programmers are working on a system that will give you a total for all viewing pages. Again please note that this is a major undertaking! In the last 3 months, since conception the company has spent well over 25 million dollars and it is not a coincidence that we are light- years ahead of where Facebook was in their initial 3 months. later. So please be patient and enjoy being part of history in the making of a great company. Enjoy the Journey! $100 US DOLLARS CASH REWARD! In the mean time it is all for one and one for all. You want to see higher rewards we really need you to start supporting by viewing every advertisement surrounding the videos both in your back office and at THW Global.com. By doing so you will help with our ratings, that in turn will help you. For the next 24 hours we will be offering a $100 reward for the TOP 3 IVs who view and support the most advertisers; including viewing , sharing VIDEOS and MORE IMPORTANT the Supporting Ads around such videos within a 24 hour period! Go For It! Enjoy Your Day! When you login to your FREE MILLION DOLLAR IV Back Office. Spend as much time as you can Searching and Viewing all surrounding advertisements and if you need it then buy it! When you login to your FREE MILLION DOLLAR IV Video Viewing Website. Spend as much time as you can Searching/Viewing all surrounding advertisements and if you need it then buy it! If you see something maybe one of your friends would be interested in buying share it with them! IN THE WORLD! HELP US HELP YOU!QUOTE OF THE DAY! More Beta Testing Countries added (see Picture below). Also, THWGlobal believes that IVs will begin to view and receive videos credits within weeks. There is actual content to watch. 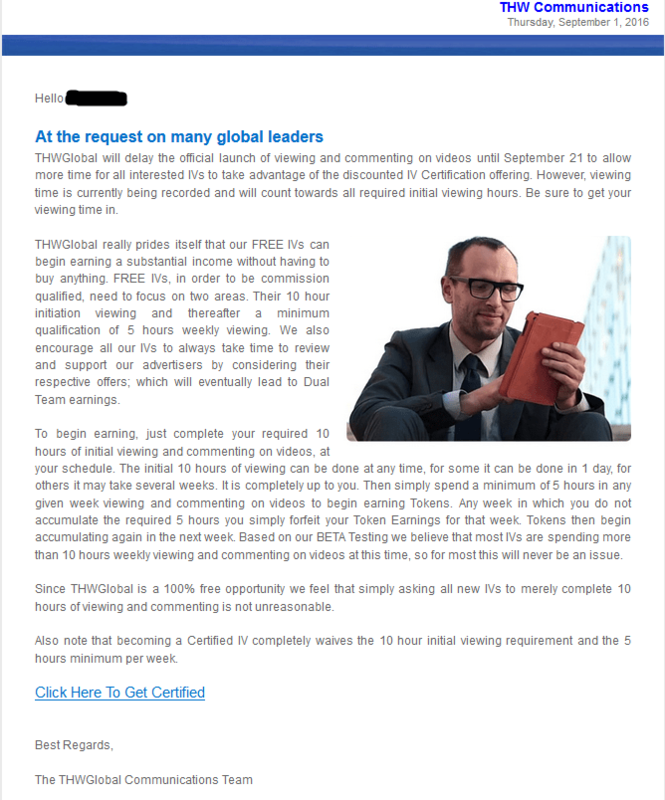 So, as of 08/07/2016 I received an short email stating THWGlobal has launched and you are able to able to watch videos here: http://thwglobal.com/VideoCenter/Index. Your going to have to sign up first so you can do so here Join THWGlobal. The email is shown below. You can get a idea of the video and also the type of content available there. More on that later. 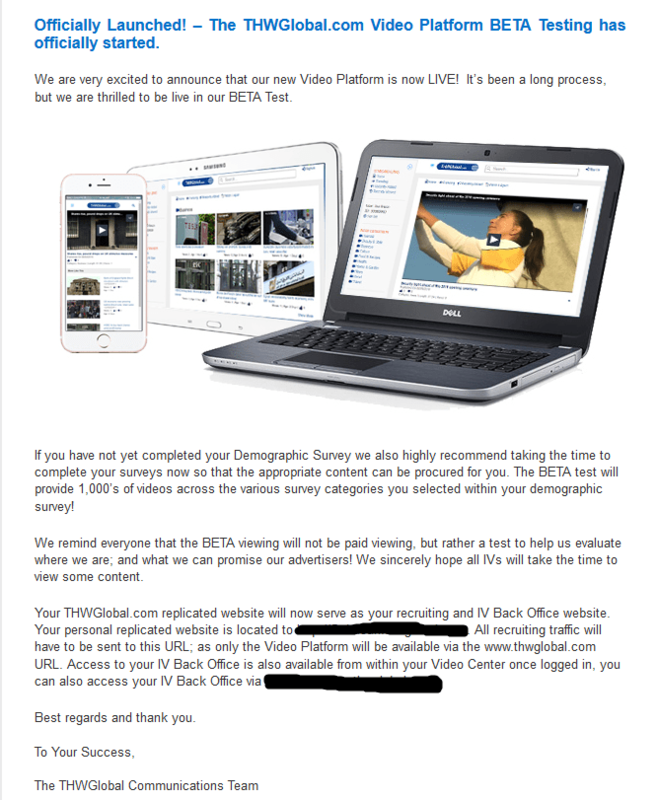 Also addressed in the email was if you haven’t completed your demographic survey to do so as it has something about they type of content that you will be procured with. Apparently, the beta version will have more than 1,000 videos to which to watch. Variety is a good thing when it comes to what to watch. Things are starting to look more positive for THWGlobal and maybe just maybe it is not a scam. But can’t tell until the first payment is posted. The video is in Beta and is only for viewing and not paid viewing, yet…So you can watch the videos now, to verify for your self that they are actually working on the site but your not going to get paid for it until they fully launch. They are also hoping that IVs will take the time to watch some videos so they can go back to their advertisers and show actual numbers in the beta launch. This is example of the video at THWGlobal. Play to See. This is a relatively new company that is still hasn’t got all the working parts up and running yet. As stated above THWGlobal stands for “Ten Hours Weekly Global”. Hold your socks boys and girls because it still has yet to be determine if THWGlobal is a scam or a legitimate company. So caution must be shown as not to divulge to much information to an unknown company. The good thing is they don’t need any sensitive information as to signing up and taking a look around for your self. Fell free to sign up THWGlobal sign up. So that being said lets dig a little more into what they say they will offer and what the hype is all about. ThWGloabl claims that you will be able to make up to $25.00 an hour watching videos. 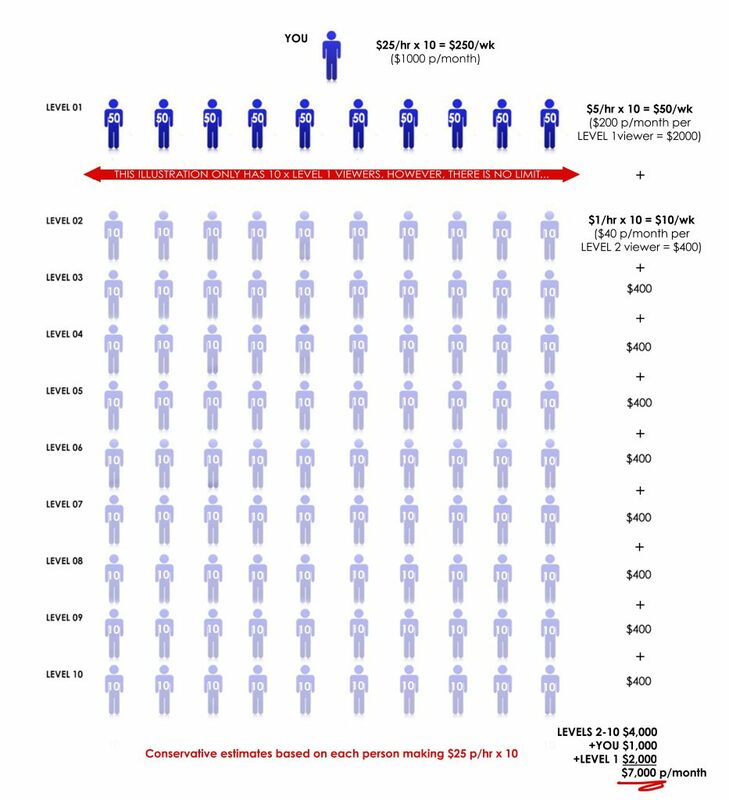 So in theory you would watch a maximum of 10 hours a week ($50.00 a week) and you would make a percent of people who sign up under you of what they made. I don’t know if this is original content or just content from other sources. It has the look and feel of YouTube a little bit. With views posted and a rating system in place with thumbs up and thumbs down way of rating a good or poor video. Why fix what already works, right? That where the similarities end and the differences emerge. Like for example, the viewers get paid and not the content providers. Kind of turns everything on it’s head compared to YouTube. While things are still up in the air at THWGlobal, I have a found a proven method of making money online, that is 100% legit. It is my number #1 Recommended way to make money online. So, it is very possible. You can check it out here My #1 Recommend. Also if you have any questions or comments, I would love the opportunity to hear and answer them. Thanks! This is another interesting concept. If this deems to be legit I wonder exactly what they would be looking for from the viewer. I would assume comments on the videos but more so what type of comments? reactionary, technical, is it watchable, believable, etc. All of that along with what is the content of the videos make this very intriguing. Jason, you have some pretty insightful ideas to what they might potentially want the viewers to comment on, on top of just watching the videos. I did notice during the test phase of the video they had a thumb up and a thumbs down icon to click on. To rate the videos. It could potentially be a great way to earn money and like you said it is intriguing. Thanks for the comment. P.S. Also sign up to receive updates from THWGlobal. Hello Sir. Sorry to bather u but need some clarification according to your understanding about the $10 Power Leg bonus. To be perfectly honest I am not sure how it works, but I know the more people under the better. I was going to research it and reply back to but the site is down again.